When the time comes to say goodbye to the pacifier, children and parents might have harsh reactions to the change. Through the years, the pacifier has been the easy way to provide comfort in difficult, scary or sad time. It could be called a paci, binky or something else. Whatever the name, this small item means a lot to a child. Still the pacifier can't be with the child when they go to high school. When the time is right, both the child and parent must break the pacifier ties. The app, Pica Pacifier, gives parents and children a way to accept that it is time to say goodbye to the pacifier. 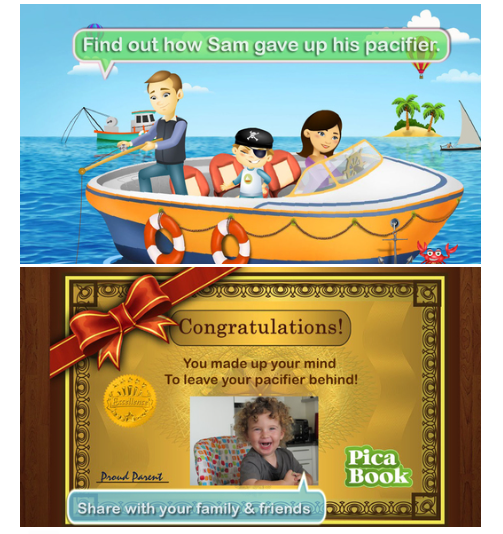 The interactive story app shares Sam's journey to say goodbye to all his pacifiers. The story shares moments when a child could benefit from not having the constant companion of a pacifier. For example, when Sam wants to play with his friend, the pacifier makes it difficult for him to talk with his friends. This scene, like many others in the app, simply show a child that he is ready to say goodbye to his pacifier. The key lesson to take from the app is that the child needs to ready for the change. While some of the ways that Sam throws away his pacifier may not be right for your household, the concept of giving away the pacifier is a good one. Just taking a pacifier away doesn't help the child realize that he can self comfort or is safe without the pacifier around. Combining the child's choice and parental support, the pacifier can become a childhood memory. When a child appears ready to say good-bye to pacifier, the Pica Pacifier app is a great way to get your child prepared for the change. From seeing another child make the change to the certificate congratulating the accomplishment, your child will be ready to take the step to growing up. Pica Pacifier is part of the Pica series of books and apps. Available in the iTunes store, Google Play and Amazon. Would you like to add this app to your smart device? I have 4 codes to giveaway. Please use the Rafflecopter to enter. Disclosure: The writer was given this app for purposes of this review. Additionally, the writer was compensated for her time. All opinions are her own and were not influenced by others. Thankfully, my daughter never liked the pacifier! I have a one month old now though so that may be a different story, although he doesn't use one much either! Our first child didn't like the pacifier and we learned with our other 3 not to introduce it. Then we wouldn't have to break them from it. This is cute! Both of mine only took one for the first few months. I had an easy way of breaking mine from the pacie. The window was rolled down in the car and he got mad and threw it out.No more pacie. This app does sound wondeful. My son would really enjoy this app. We learn something new everyday. I think it's really hard for babies or toddlers to break out of that confront zone my friends kid is 2 years old still has a paci and I'm so lucky my son spit them right out so I didn't have to worry about that. This is wonderful! I wish they had this when my kids were little! Thanks for the info on this! I don't have any kids, but I know that the paci can be a hard habit to break! This is a cute idea for the kids and helping parents out with difficult task. I don't have a kiddo, but apps seem like a great way to help out with lots areas to learn. I'm in higher ed and apps are helpful to my students. with 5 kids, we absoutely used pacifiers, but they all dropped the habit differently. some got tired of it, with one child, we ran out of pacifiers and told her and she was fine anyway. but these apps may have speeded the process! This is great! luckily after having such a hard time taking away the paci with our first child we decided to opt out using it for our other two children.